Most of us have slippers, some even have more than one pair. They are mainstays in our homes. We wear them all year round, and we bring them when going out on vacation, here or abroad. Going to the beach or the provinces this summer is incomplete without our favorite slippers or flip-flops. But we never imagined that making some of those slippers could be this deadly to workers. 72 people who worked for outrageously-low wages for slipper-maker Kentex Manufacturing Inc. died this week in a fire that gutted down the company factory in Barangay Ugong, Valenzuela City. the January 2015 collapse of a warehouse wall in Guiguinto, Bulacan that killed 12 workers. the May 2014 fire at an illegal electronics warehouse in Pasay City where eight workers died after being locked up there by the owners. Whatever product they are making, building they are constructing, or store they are tending, I think we would all agree that our workers deserve both a living wage and safe working conditions. They shouldn’t be treated like slaves and locked up like animals in cage-like conditions. Fact-Finding Mission: What happened to Kentex? What happened to Kentex? Why were the workers not able to escape? Were there fire exits? Were occupational health and safety standards in place to protect the workers and to prevent or mitigate the impact of accidents such as the factory fire? To answer these and other questions, a Fact-Finding Mission was conducted by the Institute for Occupational Health and Safety Development (IOHSAD), the Center for Trade Union and Human Rights (CTUHR), the Ecumenical Institute for Labor Education and Research (EILER) and the trade union center Kilusang Mayo Uno (KMU). Seventy-two (72) workers, many of whom were women, were burned to death and 20 more are still missing in the biggest factory fire that hit the Philippines – the fire that gutted the factory of Kentex Manufacturing Incorporated last May 13, 2015. The company, located along Tatalon Street in Barangay Ugong in Valenzuela City, manufactures rubber slippers for sale and distribution in various parts of the Philippines. There are more than 100 workers out of the less than 200 workers who were hired by the CGC agency and were receiving only a daily wage of P202 plus P187 to P220 daily allowance, depending on the number of years of service. Agency workers also complain that they discovered that the CGC agency did not remit their SSS, Philhealth and PAG-IBIG contributions and that whenever they complain, the agency would only return their contributions instead of enrolling them in the said mandatory social benefits. Apart from the daily-paid casual workers who were hired by the manpower agency, there were also workers who were hired on “pakyawan” or piece-rate basis. These workers work for 12 hours a day without formal contract. Mary Ann Tenis, 30 years old and a single parent of three children, was one of the victims. Her youngest was just nine-month old, according to a friend who was waiting for news about her friend. 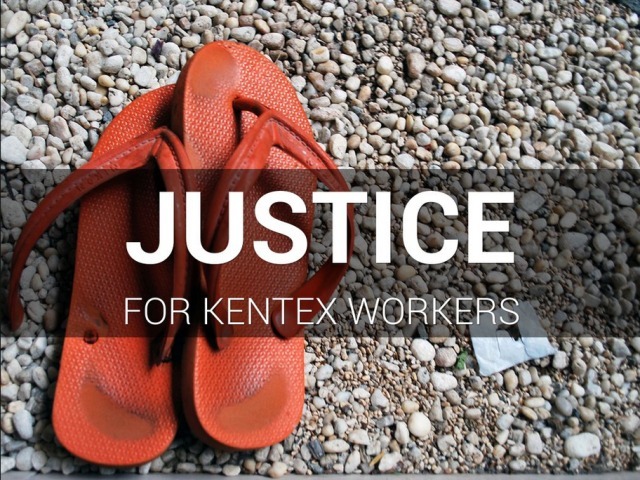 Tenis had worked for Kentex for five months and was hired as a piece-rate worker. Hold the DOLE and the Bureau of Fire Protection who gave the company compliance certification accountable for the factory fire and deaths of almost a hundred workers and employees. Investigate the process of inspection for the issuance of compliance certification of Kentex. Impose criminal and administrative penalties/charges (?) to key DOLE officials in-charge of the issuance of the compliance certificate. 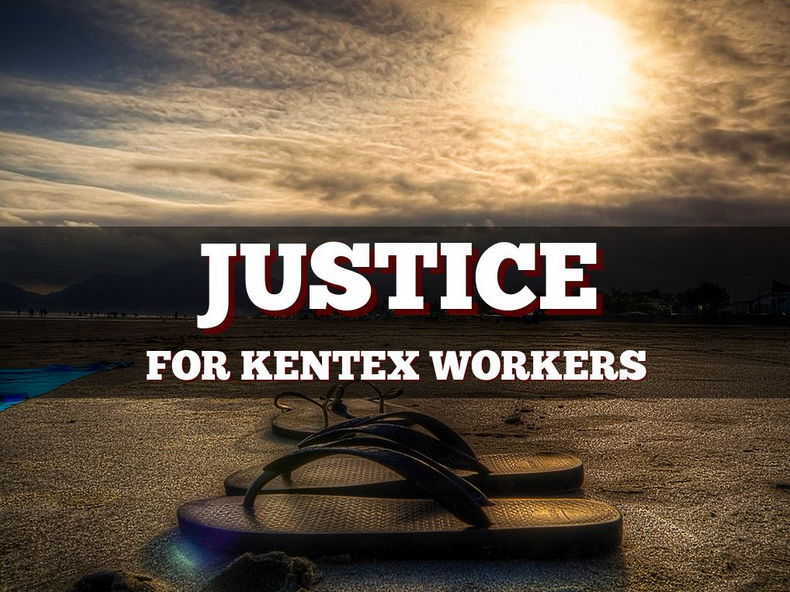 The imposition of criminal and administrative penalties on Veato Ang et al., owner of Kentex, and all owners of companies who have clearly violated occupational health and safety standards that resulted in the death of workers. Just compensation for the families of victims, proper benefits for workers who lost their jobs after the fire, and long-term support for orphaned children. Repeal of DO 131-13 and immediate passage House Bill 4635 or Workers’ SHIELD (Safety and Health Inspection and Employers’ Liability Decree) that will make violations of occupational health and safety standards both criminal and administrative offenses, while providing victims avenues for justice.